Our little author/illustrator is busy at work. It seems like our eldest child might have a better chance of publishing her work than her wannabe-a-writer mother. At least, given the shear amount of material she creates week to week. 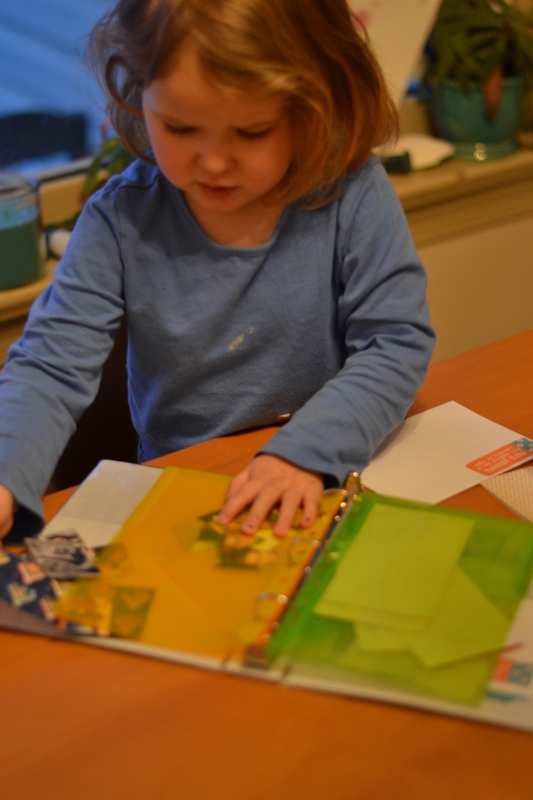 Nora started making books this fall at her school in Pennsylvania. Things really kicked into gear, though, once we moved to Connecticut. To date, she’s made something like twenty-one books, only one of which is actually complete, mind you. Most consist of a title page and maybe two to three pages of drawing with text. In the beginning, she required a lot of help with spelling. Recently, she’s been trying to manage on her own. I love discovering her latest creations and admiring all the effort she puts into her craft. A season’t worth of books crafted from folded 8-and-1/2-by-11-inch paper and staples. “Somewhere Over the Rainbow” and “Ellie and the Doghouse” with strikingly similar characters and settings. Note the legless child on the left. Not sure what her deal is. This one is a little harder to interpret: “That next morning, Emily and her best (friend?) Lizzy went in the car. They went to…” Where did they go? Read on to find out! “That night (she must’ve gotten help with those two words!) they went to Grandma and Pappy’s and Grandma’s and Grandpa’s…” “Hooo Choo.” Are they owls? On a train? I don’t know. Love the imagination and detail here with the view of the back side of the people. Also love that the characters on the right page are sitting in pews at church! “Where is My Halloween Basket?” Lately we’ve been making flip-books modeled after some of our lift-the-flap favorites. These are a total pain to make, because instead of just folding and stapling paper, I have to tape together every couple of pages and then cut out little squares behind which Nora draws hidden images. the end result is worth it though. And why in the HELL are that guy’s legs so damn long?! Lastly, I just had to capture this birthday card while I was recording images of the books. It’s from Nora, given to me a couple of weeks ago. “Now you [are] 37, but soon you’re going to be 38.” Thanks for the notice, girlie. I like to think that I will keep some of these to show Nora when she’s a bit older. Not insta-throw them away like I do much of the art work that gets made around here. I’m trying to be better about photographing the pieces I like best. My plan is to preserve the images in some kind of keepsake book, so we don’t have to hang on to the actual physical clutter. But these books are pretty special. So, I’m thinking we’ll save a few for posterity. And, if not—if some get lost or accidentally thrown away in a fit of clutter-rage—at least we’ll have this post of evidence of the work that was done. This entry was posted in Clutter, KidCreativity, NoraTalk, Writing and tagged Kid Writing on May 3, 2016 by powerskirstin. Birthing play toys, nursing baby dolls, and neti-potting. All in a day’s work (play). You’ve likely heard the phrase: art imitates life. How about: toddler and preschooler imitate life? No? Surely those of you living and/or familiar with small children, can recognize their capacity to be inspired by both the mundane and significant details of the lives of those individuals within their intimate inner circle. And, their subsequent aptitude for acting out, in all their make-believe glory, those details, rituals, and behaviors. She goes into her bedroom for privacy, proceeds to stuff the play-fetus-of-the-moment down the front of her shirt/sweater/footie pajamas, emerges to show us all the spectacle that is growing inside of her, and then makes a big show of all the excitement and expectation surrounding the upcoming birthing event. Then, she retreats back to the bedroom for what I imagine is the world’s most pain-free labor, and re-emerges with the play-child wrapped in a blanket or covered in a crib, only to unveil him or her to the whole room of waiting-with-bated-breath-family-members—me, Franny and Liam. We go through the rituals of greeting and holding the baby-dog-doll-merchild, only to do it all again many hours later. The youngest has only birthed one baby doll so far; she prefers to push her babies around in the stroller with a tote bag slung over her shoulder, stopping occasionally to lift the baby from her seat and “nurse” the baby mid-stride. 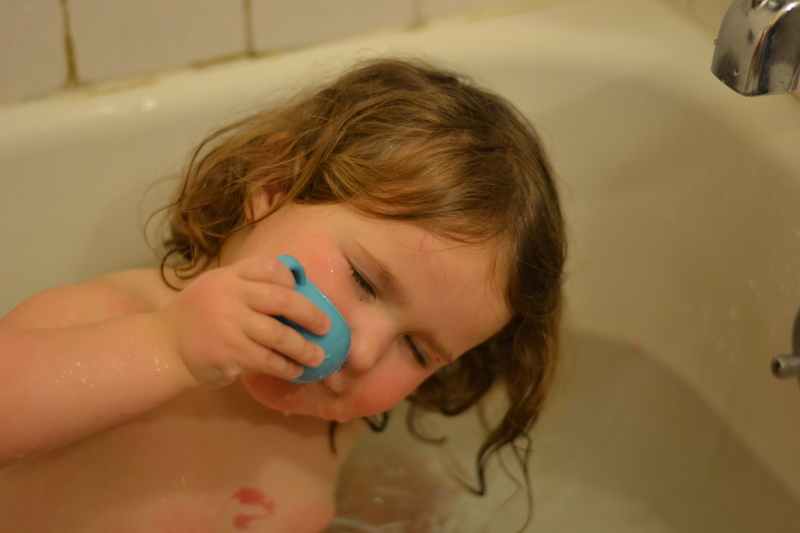 To top off the latest string of imitation events, just last night, my husband caught the oldest child attempting to neti-pot—is that even a verb?—with a play tea-cup, in the bath (I’ve been using one to lessen my cold symptoms this week). I thought this last action could potentially end up as a near-drowning event, but she seemed to handle the forced water to the nose like a pro; there was very little sputtering and coughing. I find it so amusing, satisfying, and flattering to see my beloved little people imitating one of their favorite grown-ups—me. Adventures in neti-potting. Note the “lips” tattoo that has resided on her chest for the past two weeks. Liam has declared it gone by tonight’s bath. This entry was posted in KidCreativity, Make-believe, Parenting on February 17, 2015 by powerskirstin. My maternal grandmother was a devoted letter-writer. The buffet in her dining room was always stocked with pens and pencils, stationery and stamps, stickers, notepads and other odds and ends, like sparkly celebratory confetti, which she’d thoughtfully sprinkle inside an envelope to mark a special occasion. She wrote to her children, her grandchildren, her dear friends and other close relatives. Although she is no longer with us, I remember this about her fondly. 4th grade students at my school were recently asked to read a piece of text about a postage stamp that commemorated a famous person’s life. The students struggled to understand the text because they had no background knowledge about postage stamps. In the current digital age of electronic communication, old-fashioned letter writing is becoming a thing of the past. When I saw this great idea for a writing center on one of my favorite blogs, I sought to create something like it we could use in our house for our oldest daughter, Nora. 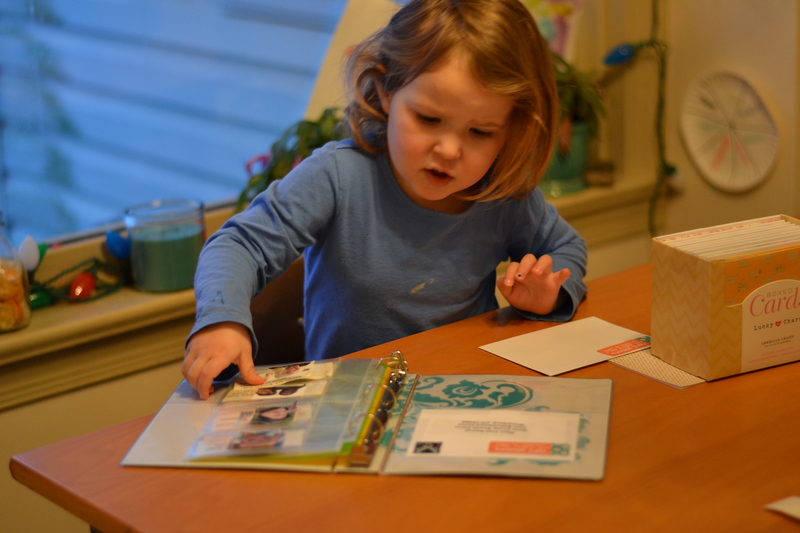 Writing letters to family and friends has become one of Nora’s favorite activities. I keep the writing bin on a shelf where she can reach for it whenever she’s so inclined. 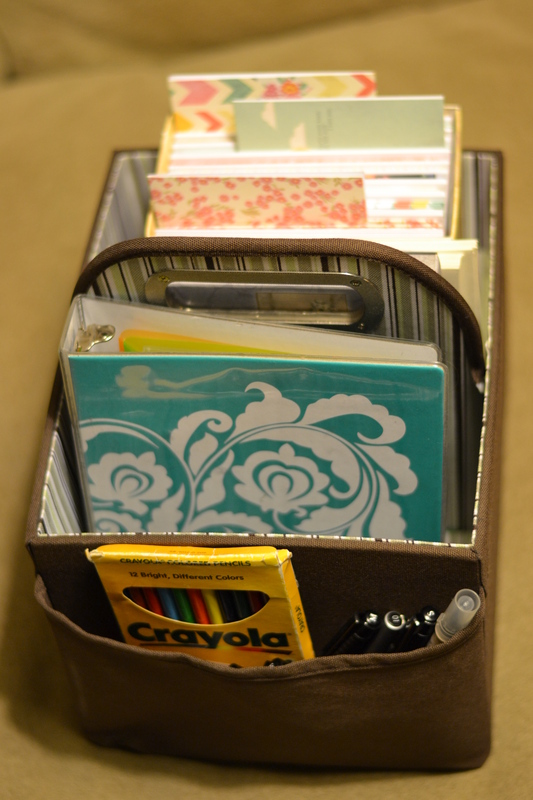 In it we keep cards and envelopes, fun writing pens and pencils, and a small three-ring binder which holds pre-printed address labels, stamps and stickers. I just bought some really cute personalized labels from Etsy for Nora to use as a return address label. She loves that she can read and recognize her name on the sticker. Using the model to correctly place the stamp and labels. I put a stamp and some address labels on a spare envelope and taped it to the inside cover of the writing binder so Nora could use it as a model for how and where to place her stickers. I bought some pages with pockets in which to hold the address labels. Since she can’t yet read the labels, we taped photos of friends and family on the front of the sleeves so she can identify the labels. We just updated our photos by repurposing this year’s holiday cards. The cut-out faces of our favorite friends now line the pages of our book. She’s able to choose a person by photo, select the appropriate label, affix the stickers on the envelope, and stuff and seal the envelope herself. The only thing she can’t do on her own is write the message. Getting a stamp from the stamp page. When it comes time to write the actual letter, Nora tells me what she would like to say and I simply scribe for her. This evening she wrote the following letter to my friend’s daughter, Mira, who lives in Boston (my friend also happens to be my husband’s cousin, so Mira is technically family). I hope you come to my house soon when the snow is still here. I hope you have fun in the snow when you’re not at my house. I wish I could come to your house. Can I come to your house when it’s snowing? I really want to. Nora insists on signing her own name to each letter. She also watches me to make sure her words don’t run too long. It’s a must that I leave some blank space on the inside of the card for her to draw a picture. I love that she is learning a craft that her great-grandmother cherished. Writing is also a great way for her to connect and keep in touch with family and friends we don’t get to see often. Lastly, it teaches her to be courteous (we send lots of thank you notes!) and encourages her to be thoughtful. Our little Frances is proving to be just as chatty as her big sister—although not nearly as intelligible as Nora was at her age—so I’m sure this center is going to get lots of use at our house in the years to come. This entry was posted in KidCreativity, Montessori, Writing and tagged Letter Writing on January 9, 2015 by powerskirstin.